UPDATE #3: Just a reminder, per the event posting, gratuity is not included in the dinner. So please consider tipping our waiter what you normally would. It’ll be a large group, and I’m sure s/he will welcome the show of appreciation. Please account for Metro, traffic, and parking delays, and please arrive on time! UPDATE #2: The early-bird price has ended and the ticket price is now $40. I look forward to seeing you there! UPDATE #1: There are fewer than 10 early bird spots left and the price will increase from $35 to $40 when the early bird spots are gone or by Sun. Jan. 7th (whichever comes first). To be fair to those who want to join in and are ready to make payment, I’ll be removing those that haven’t paid by Sun. Dec. 31st. Make payment to lock in the early bird price and your spot (see the “Payment” section of the event posting). If you’ve already made payment, the PayPal email you received is confirmation that we’ve received your payment (no need to message me asking for ticket confirmation). This UPDATE has been emailed to the yes RSVPs. I hope to see you there! Let’s get together for dinner and a night out! I’ve made special arrangements with Haad Thai for dinner and Ultrabar for a night out! At 7:30pm, we will check in and hang out at the bar. 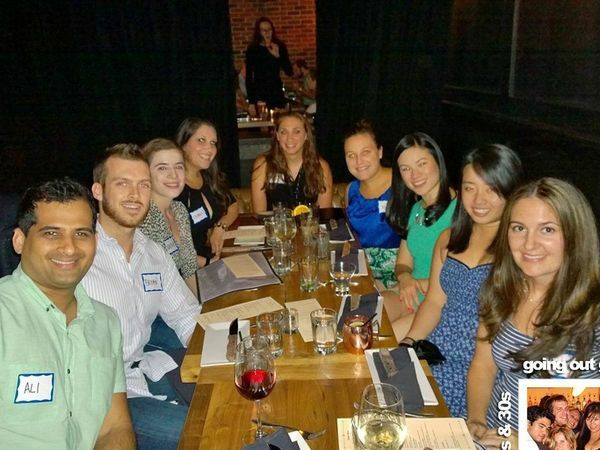 We will be then be seated and dine on 3-course tasty Thai cuisine while getting to know each other starting at 8pm. For those that haven’t been there before, Haad Thai brings traditional dishes of Thailand to DC. Scenic wall murals and charming atmosphere set the scene for this Southeast Asian restaurant! Ultrabar features a unique blend of classic architecture and modern amenities and 4 different levels, each with it’s own DJ! 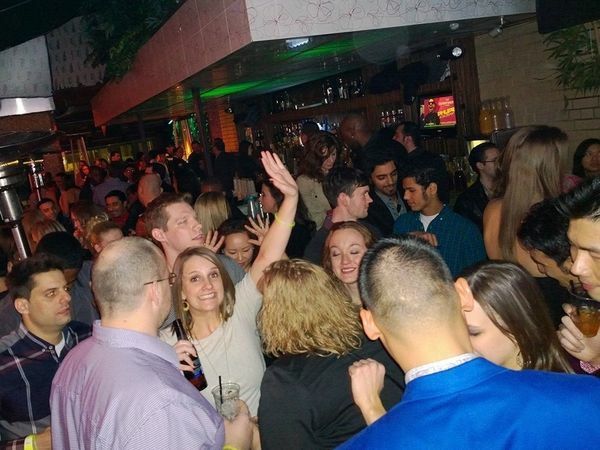 After dinner, we’ll head on over to Ultrabar (cover is normally $20, which is included in our ticket price) and let loose for a night of dancing, music, drinks, and fun! From 10 – midnight, we’ll have our own drink specials before the regular crowd gets there. 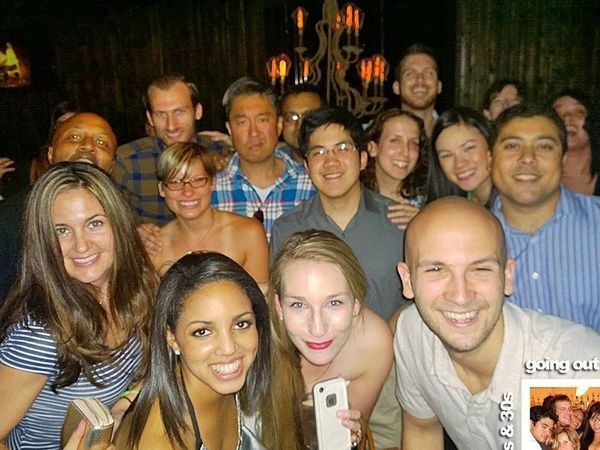 After midnight, we’ll keep it going all night with the usual Friday night crowd! Please note gratuity is not included for dinner. We’ve got an early bird special for this event of $35! The first 30 paid sign-ups, or those who pay by Sunday, January, 7th (whichever comes first) get the early bird price! After that, the ticket price will go to $40. We have a LIMITED number of spots so make sure to RSVP early AND make payment to secure your spot and get the early bird price! To make payment, please follow the steps in the “Payment” section of the event posting. 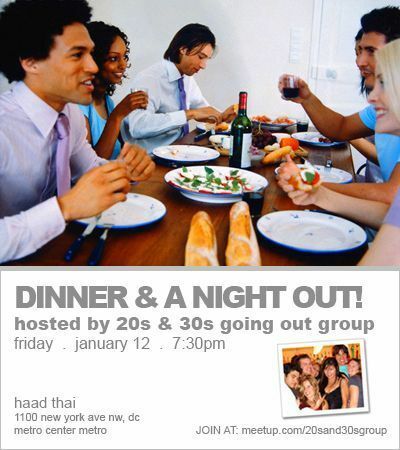 Come join us as we spend a great evening having dinner and a night out with others from our group! The closest Metro is Metro Center (Blue, Orange, Red, Silver lines), about a 1 minute walk, and Gallery Place – Chinatown (Green, Red, Yellow lines), about a 2 minute walk. I suggest Metro / cabbing / Uber’ing if you can. I also recommend using wmata.com for travel planning. Don’t forget to account for Metro, traffic, and parking delays. If you are driving, you will need to find street parking or a garage. I recommend using parkopedia.com for garage parking planning. Dress code includes includes no hats, no athletic gear, no baggy clothes, no t-shirts, no flip / flops, no casual boots, no ripped jeans, nice sneakers ok. Suggested attire for men: button up collar shirt with slacks, hard-soled dress shoes. Please be on time. If you are late (arrive after the start time of 7:3pm), you risk the possibility of not being able to join us for the event. I will have a master list of all those that have paid. It’s not required, but I recommend printing out your payment confirmation email as a backup (if you are not on the list, you will be required to show it). When you check-in, your RSVP will be listed under the name of the PayPal or credit card account used to make payment. Typically, this is your LEGAL name as shown on your driver’s license. Sometimes, it may be under a company name if you set up your PayPal or credit card account that way. If you are not sure what it is, please log into your PayPal account (it will say “Welcome, [your account name]” at the top) or your credit card account to find out. If you are RSVP’d under someone else’s payment, please use that name for check-in. Similar to a concert ticket or a football game ticket, you are free to sell / transfer your ticket to someone else if you are unable to attend. I suggest posting in the comment box for the event, that you have a ticket for sale / transfer. Work out any payment between yourselves, and have the seller only send me (the organizer) a message through my Meetup profile (do not comment in the comment box of the event posting) letting me know the first AND last name, and Meetup profile URL (if a member) of the person taking your spot (please also copy them on the message). To obtain their Meetup profile URL, go to their profile from the mobile website or your computer (not the app), and copy & paste the URL from your browser. I host a lot of events and groups, so please let me know the event name and group name the ticket transfer is for. You must let me know by the RSVP close time of 4:30pm on the day of the event. Should inclement weather (e.g. snow storm, hurricane, etc.) affect our event, we’ll need to reschedule or cancel. If any one of the following is not available for service due to inclement weather, we’ll need to do so: Metrorail is not running to all stops; Uber (X, SUV, etc.) is not running or available at no more than 2x standard rates; venue(s) are not open. I’ll post an UPDATE to the top of the event posting by 5:00pm on the day of our event with the details.